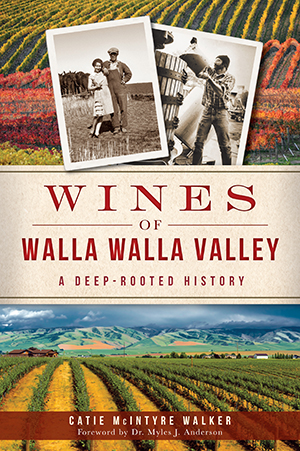 As early as the 1840s, French settlers brought their knowledge of wine to Washington's Walla Walla Valley. The highly fertile soil and abundant water were perfect complements to their Old World winemaking traditions, halted only by Prohibition and the historically unmerciful weather conditions. A century after the first settlers arrived, the area's wine industry reestablished itself when new pioneers like the Italian Pesciallos and Leonettis opened wineries in the early and mid-1900s, a trade that continues to thrive today. Discover the southeastern portion of the Washington Territory along Lewis and Clark's trail in a whole new light with the trailblazing vintners of the Walla Walla wine industry. Taste the history in every glass with wine writer and Walla Walla native Catie McIntyre Walker as she unearths the valley's transformation from Wild West to world-class wine region. Catie McIntyre Walker is a native of Walla Walla, Washington and the original Walla Walla wine blogger, known as the Wild Walla Walla Wine Woman, since 2005. Dr. Myles J. Anderson is a 2011 inductee to the Legends of Washington Wine Hall of Fame and the founding director of the Institute for Enology and Viticulture at Walla Walla Community College. He is the owner and winemaker of Walla Walla Vintners. Nick Velluzzi is the director of institutional planning, research and assessment at Walla Walla Community College. He has a bachelor's degree in international studies from the University of Oregon, a master's in urban planning from the University of California, Los Angeles, and a PhD in economic geography from the University of Washington.